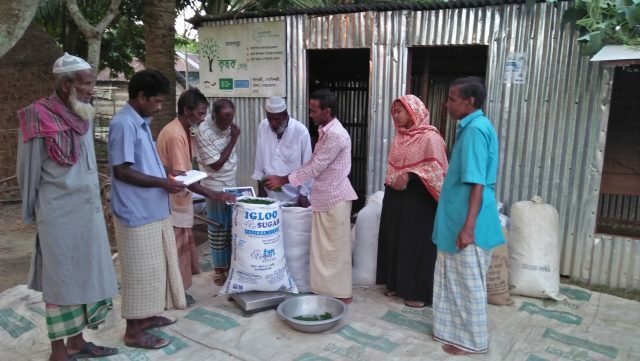 Farmers of Kodomshree village (Madan Upazila) in the flood-prone Netrokona district of Bangladesh have come together to create a collection centre where farm products or crops are collected and marketed. Situated in Bangladesh’s highly vulnerable Haor region, Kodomshree village faces flash floods every year between June and November. 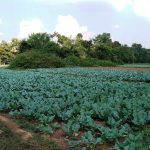 Farmers in the area have almost half a year to grow and market their crops, as the rest of the time the area is largely inundated. To utilise this short duration for cultivation efficiently, the farmers’ groups of the area have come together to form a Collection Centre (CC) that not only enhances their market access but also ensures them a fair price. 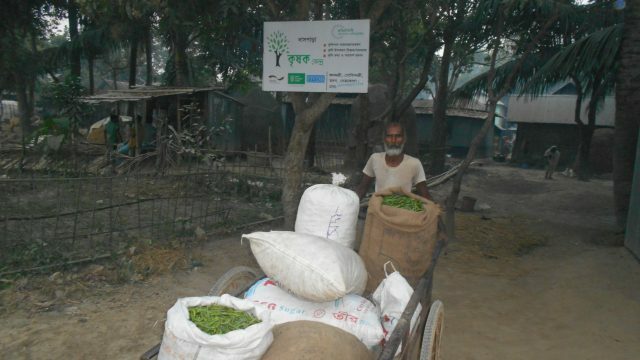 The collection centre is located at Daspara, a well-connected place, where all the members of the farmers’ groups can easily sell their produces such as vegetables, spices and grains. The aim is to get the produce at a particular place, approach large and distant buyers and sell it at farm gate price. This way, the farmers save time and transportation costs and have an easier access to the market. 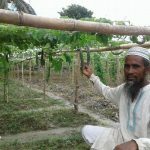 Established through the contribution from farmers, traders and the Welthungerhilfe and the German Federal Ministry for Economic Cooperation and Development (BMZ) supported Community Social Enterprise project in Netrokona district of Bangladesh, the centre currently involves 11 farmers’ groups (covering 291 farmers). 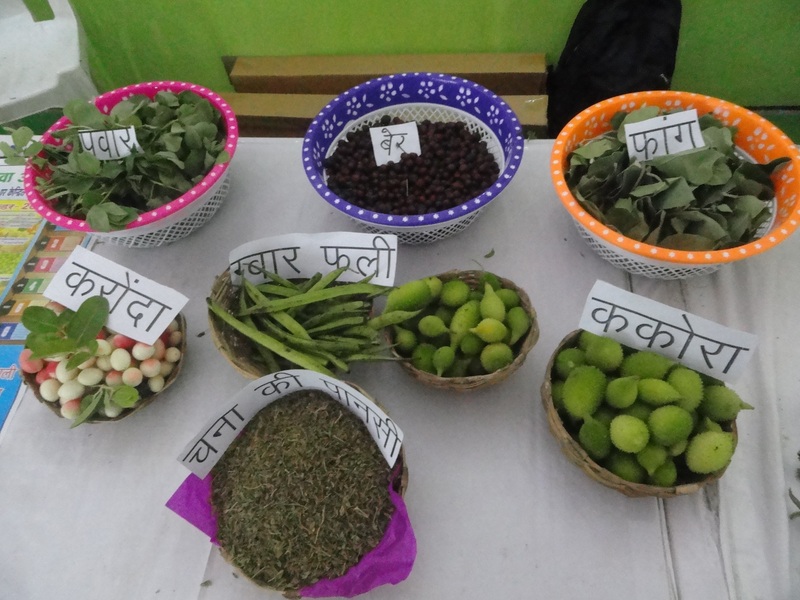 Different crops such as green chilli, sweet gourd, mustard, brinjal (aubergine or eggplant) are collected, sorted, graded cleaned, weighed and packed at the Collection Centers. To ensure the smooth functioning of the Collection Center’s activities, a committee (Collection Centre Management Committee or CCMC) is formed, which comprises the representatives of farmers’ groups and key traders as well as Resource Farmers (RF) and Community Resource Persons (CRP) that are engaged under the project to provide support to smallholders. The committee oversees the management of the Collection Centre and its overall operations. Its main responsibility is to connect and negotiate with traders/vendors, ensure a fair price for producers, collect and provide market information, manage finances and maintain records. The members meet once in a month at least to discuss how the Collection Center is functioning, where the problems are and what needs to be done to resolve them. Generally, the farmers directly bring their produce to the Collection Centers and the CCMC connect them with local and big traders from the district and ensure it is sold. Initially, to start the business, the Daspara Collection Centre generated a business capital of BDT 55000 with 11 farmers groups contributing BDT 22000 (each group gave BDT 2000) and CCMC members contributed BDT 33000 (each CCMC member gave BDT 3000). When the centre began functioning, it collected 12010 kg green chillis from 105 farmers first and sold it to traders on market price, making a profit of BDT 9830. 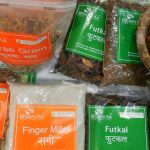 Then the centre collected 3000 pieces of sweet gourd from farmers and sold it to Netrakona district bazar and got a profit of BDT 3000. Within four months, the profit increased to BDT 13830. Now the collection centre is well established. 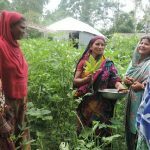 At least 6 traders from the area are regularly purchasing vegetables, spice crops and grains from there. Farmers are getting an additional profit of BDT 5-10 per kg as they are able to save on transportation cost. 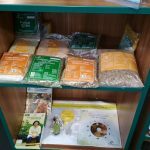 On the other hand, traders are also getting an additional BDT 10-15 per kg through trading crops from this Collection Center as well as expected quantity and quality of produces.